Any bookings made for the following tours directly from our site will earn us a small commission. Mahalo! Not everyone is interested in the paranormal and we respect that. That's why we also offer a non-paranormal history tour. 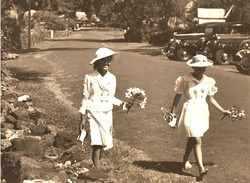 ​Take a step back in time on a daytime history tour through Kona. Visit and experience some of Kailua-Kona's most important historic sites, including a Hawaiian Palace, the first Christian church in Hawaii, a King's temple, and more. This is a history tour and does not include ghost stories. Meet your guide and set out to explore Kailua-Kona's early origins and the wonders of Hawaii's mysterious past. Learn about rulers like King Kamehameha, who united all the Hawaiian islands, and Queen Liliuokalani, the last monarch of the Kingdom of Hawaii. As you explore, discover how Kailua-Kona went from a small fishing village to Hawaii's first capital city. ​Along the way, visit an ancient Hawaiian temple as well as the Hulihee Palace, the one-time vacation home of Hawaiian royalty. Step inside Mokuaikawa Church, the first Christian church in Hawaii, and see the Hale Halawaio Holualoa church, which is built of lava rock and coral. Stop by the 1928 Kona Inn with its famous red roofs, and pick up pointers on other great areas to explore from your guide, who has called this pocket of paradise home for more than 40 years. Tour Nights: Monday, Wednesday, Friday and Saturday evenings. Tour time approximately 1.5 hours. Moderate walking is required** This is approximately a one mile walk, so we recommend wearing comfortable shoes. Tour begins at 5:30PM. We must have a minimum of two (2) total guests to run the tour.﻿ Private tours and discounts available for groups with 10 or more.